Minutes before the start of a recent New York City taping of the Netflix show Patriot Act, my dad walked out of a backstage bathroom. I’d been given a last-minute plus-one, and he was in town for Thanksgiving break. 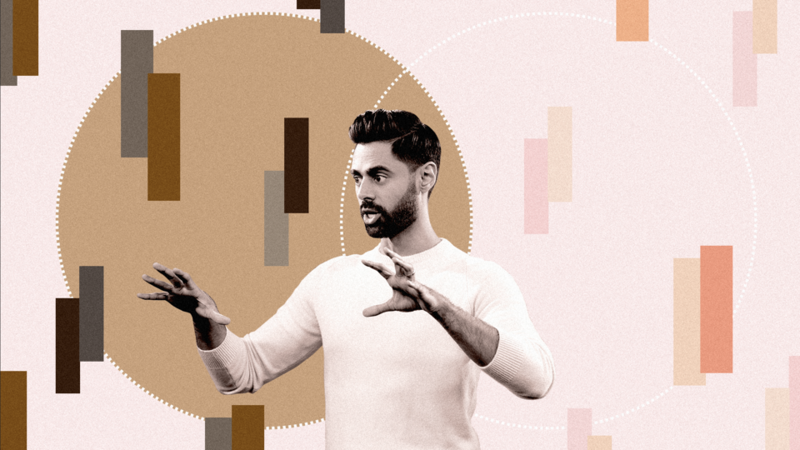 When I disclosed my guest’s identity to Hasan Minhaj, the 33-year-old comic who co-created, co-writes, and hosts Patriot Act, Minhaj’s large eyes widened. He held out a hand before my dad was close enough to touch it. “Hi Uncle,” he said, with emphasis on the second word. “I know who you are,” my dad said in response (we’d binge-watched the five episodes of the series available at that point a few days earlier). Minhaj, whose parents immigrated to America from India, as mine had, looked more hyper-alert than usual. He seemed to pick up on the undercurrent of disapproval built into the terse speech patterns of many an immigrant parent. My dad wasn’t about to say whether he liked Minhaj and his work, only that he knew it. “My dad was here, too,” Minhaj confided to my father, as if to say that he understood the sting of the two fathers’ common language—one used to indicate a “conditional love,” as Minhaj described the immigrant-parent mode in his 2017 comedy special Homecoming King. Signals to certain members of the public aren’t hard to hear, out of Minhaj’s mouth. Patriot Act, a half-hour weekly talk show that recalls in its spirit the newsy gravitas of the host’s alma mater, The Daily Show; the pace and likability of E’s Talk Soup; and the aesthetic packaging of, as Minhaj likes to call it, “a woke TED Talk,” has piqued the interest of viewers and critics in part for its presumption of a new audience demographic. Episodes use knotty topical issues to dissect hypocrisies and injustices on a national and global scale.